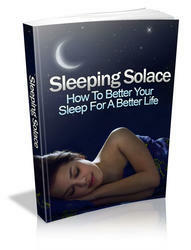 SLEEPING PILLS This is a general term applied to a number of different drugs in pill form that help induce sleep, i.e. sedative-hypnotic agents. There is a wide range of such medication and many require a doctor's prescription, but some can be purchased as Over-the-Counter drugs at a pharmacy. These latter preparations generally contain an antihistamine such as chlorpheniramine maleate, which produces drowsiness. How To Better Your Sleep For A Better Life. Understanding the importance of good sleeping habits is very beneficial to the overall health of an individual in both mental and physical levels. Learn all the tricks here.